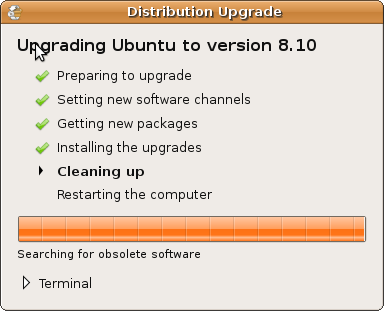 Released at the end of October 2008, the Ubuntu 8.10 receives number of features upgrade and bugs fixes. Technical details on what’s been updated or fixed under the hood are available from Ubuntu 8.10 Release Notes. The complete new features are available from the press release. Some of the new features are part of the Gnome 2.24 Desktop Environment . The following are the top 5 features in Ubuntu 8.10. Several methods are available to upgrade from 8.04. The easiest one is using the Network Upgrade. One of the requirements is all the current updates for 8.04 LTS need to be applied before upgrading. According to the upgrade notes, the 8.10 is not available by default in 8.04 update list. This is because 8.10 is not a LTS (Long Term Support) Release. For the update to be available, the Release upgrade (available from System – Administration – Software Sources – Updates option) needs to be changed from LTS releases only to Normal releases. Then, run the Update Manager again and the 8.10 should appear in the update list. The update size is about 585 MB compared to 698 MB (for standalone download version). The Nautilius File Manager features tab browsing. The view setting on one tab is independent of the other tabs. The view set on a drive or folder is preserved when File Manager is closed. One usage example is having Icon View for Pictures folder (for quick preview) and List View for File System folder (to find out Date Modified easily). 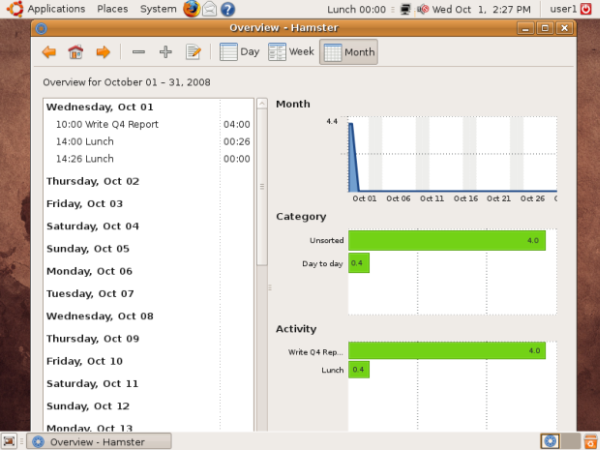 Available separately as Project Hamster, the built-in time tracker is not installed by default. It is not clearly documented on how to obtain the package. A post from Tombuntu has an instruction on how to set it up. 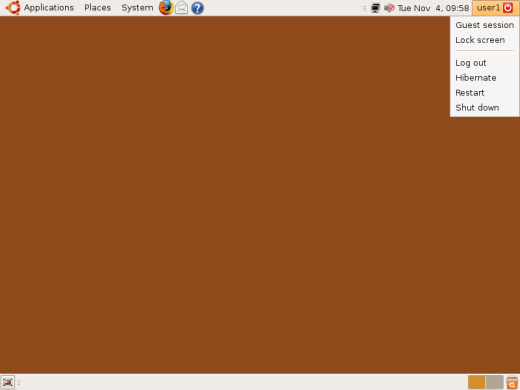 To add to the Panel Menu Bar, look for Time Tracker application (instead of Hamster). When it has been added, the status displays “No Activity”. To start tracking, click on the display bar and the activity. Guest Session is handy if someone would like to quickly use your computer (e.g. checking his e-mail) without going through your files or changing the computer settings. It also preserves the state of the desktop (i.e. restore the guest session to its original state after log off). During the Guest Session, all the installed applications are accessible. Accessing and saving local hard drive (CD-ROM access is available) are not available. If files are saved during the Guest Session, they would be automatically deleted at logout. Changes made to the desktop background, icon sizes etc are not preserved. It is similar to Windows Steady State without the hassle of installation and setup. 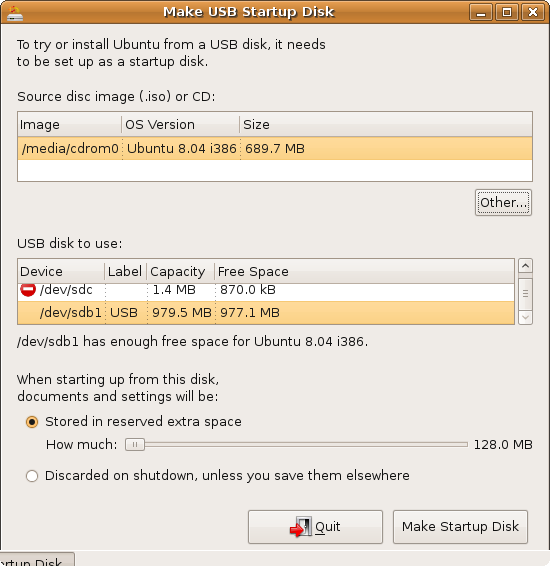 The ability to try Ubuntu on Live CD is a great way to determine if your hardware will work. New to Ubuntu 8.10 is Live USB Creator. This would create bootable USB which is significantly faster than CD. Two things are required: USB memory key and ISO or Ubuntu CD. As only 130MB is used, 1GB USB key should ber sufficient. 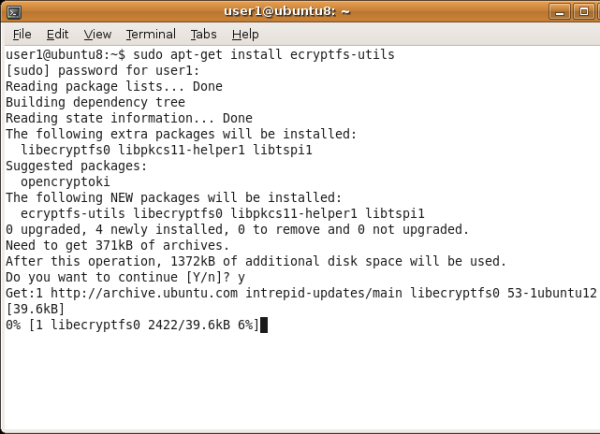 The Encrypted Private Directory utilises eCryptfs. The setup and installation are done via the Terminal session. Despite it might be overwhelming for novice user, the process is very simple. Logout and log back in to access the private mount directory. Ubuntu Documentation has further details. After logging in back to the system, a Private folder appears on the Desktop. All files placed in this folder will be encrypted. According to the Ubuntu documentation, the Private directory will not be automatically mounted if automatic login without password is setup. The difference between Encrypted Private directory and normal home directory is as different user in normal home directory file can be browsed but can not be opened. In contrast, Private directory does not allow access at all. Ubuntu 8.10 offers quite a number features worth upgrading. The tabbed file browser makes files management in nowadays giant size hard drive easier. The Guest Session comes in handy in an environment where computer usage is shared. The Encrypted Private directory is great for data security in laptop. Open Office 3 is not included but it is easy to upgrade according to this instruction. Finally, the addition of Network Manager and 3G dongle modem support are great for new technology such as netbooks that are connected to 3G network or plain old Wi-Fi.